Bye Bye Odor for Cats MAKES 256 fl oz (8 QUARTS) of Ready-To-Use product. - One (1) 4 fl oz bottle of Bye Bye Odor for Cats concentrate, which makes 256 fl oz of Ready-to-use product. - One (1) 11 fl oz Flarisol Spray Bottle. Bye Bye Odor for Cats is an all natural, non-toxic odor eliminator designed to clean up, not cover up nasty cat box odors. For cats that “mark” or “spray,” Bye Bye Odor will remove the smell from those areas. BYE BYE ODOR FOR CATS has been extensively tested for effectiveness and safety by Spalding Labs customers as well as by Tom and Barbara Spalding, long time cat lovers and the owners of the company. 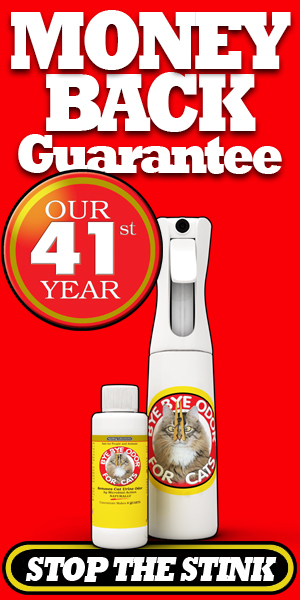 BYE BYE ODOR FOR CATS guarantees 100% cat urine odor elimination or your money back. BYE BYE ODOR FOR CATS is a concentrate. One (1) unit of BYE BYE ODOR FOR CATS makes eight (8) quarts of Ready-To-Use product. It is without question, the single most cost effective cat urine odor fighting product on the market. Stop the Stink. Order Now! It didn't just cover up odors, it actually got rid of them all together. This bottle lasted forever and was very reasonably priced. Great deal. My cats have peed on just about everything: velvet couch, silk curtains, wood floors, marble tile, stove burner, electric blanket, carpet, rugs, themselves. Cat pee used to mean lots of futile scrubbing with every ineffectual product on the market, hand wringing, cat swatting, and despair because the stink never quite came out, everything was ruined, and the whole house re-stunk vaguely on a humid day. Not anymore. I have used BBO to de-stink all of the above and successfully made them like new. However, the most intractable stink was when the cats SOAKED the untreated floor in their litter closet. This was not a wood surface, it was the actual 100-year-old heart pine floorboard, so without BBO this fix was going to require a carpenter to rip out and replace the floor. If this stuff can get cat pee stink out of an inch-thick floorboard, it can get anything out of everything. I have even used it to de-stink the cat who peed and pooed himself in the cage en route home from the vet and was too nauseating to handle. Our cat has had some "inappropriate behavior" on the carpet in one of the bedrooms. We've had professional cleaners come out, we've used our own carpet shampooer and we've used other products made to remove odor, all with little or no effect. It got to the point that, when we had the windows open on a nice day, the smell would waft from that room into the main area of the house! I used a blacklight to see where she had urinated, cleaned it up as best I could with our carpet shampooer, then sprayed Bye Bye Odor onto the area. The odor is almost completely gone! It's AMAZING. I only did this a couple of days ago, and I have seen another reviewer say not to get discouraged because it could take a couple of applications, so I will be giving it another spray or two, but already, I'm sold. I have already recommended this to friends with "inappropriate" animals. I rescue animals, so sometimes my new rescues aren't house broken. Over the years, I've tried just about everything on the market and all the natural remedies to help get rid of the odor. Nothing worked. I didn't want a cover up; I wanted something that eliminated the odor. I live in horse country where people have barn odors that must be eliminated, so I checked out horse products and came across this product. It just made sense that any product that was effective for horse odors and sensitive enough for horses' respiratory system would work for my much more minor problems. I bought Bye Bye Odor concentrate and used it according to directions. Within three days after application, the odors were gone. Not covered up - gone. So gone, that the dogs don't re-mark those spots. I promise I have no affiliation whatsoever with this company and I don't get a discount or anything for this review, although I sure wish I did! *Refund does not include postage.